Easties, if you haven’t heard of IZA, it’s about time you did. 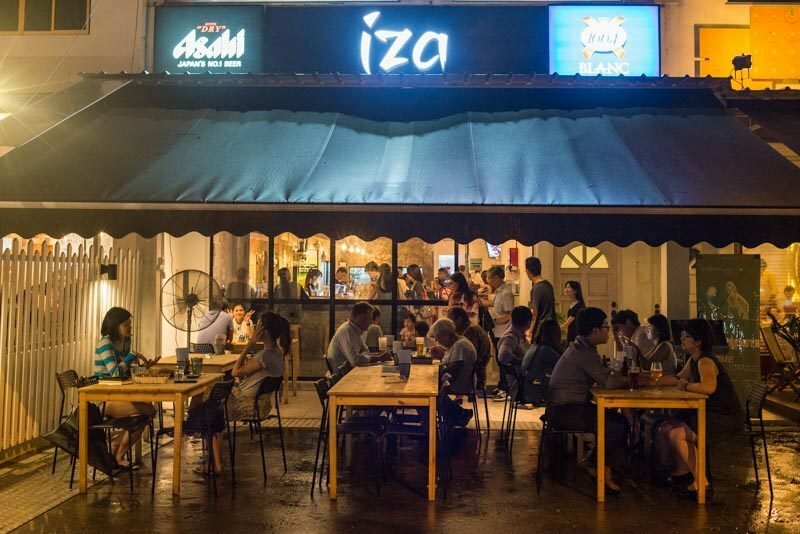 Located in Siglap, IZA is an izakaya (Japanese bar) that serves some seriously delicious Japanese-Singaporean fusion food. I travelled far and wide just to come to this place, so I would have been furious if the food wasn’t worth it. Thankfully, it was well worth the visit! Before tasting any of the food, I had to give some of the drinks a go. After all, it is a bar. 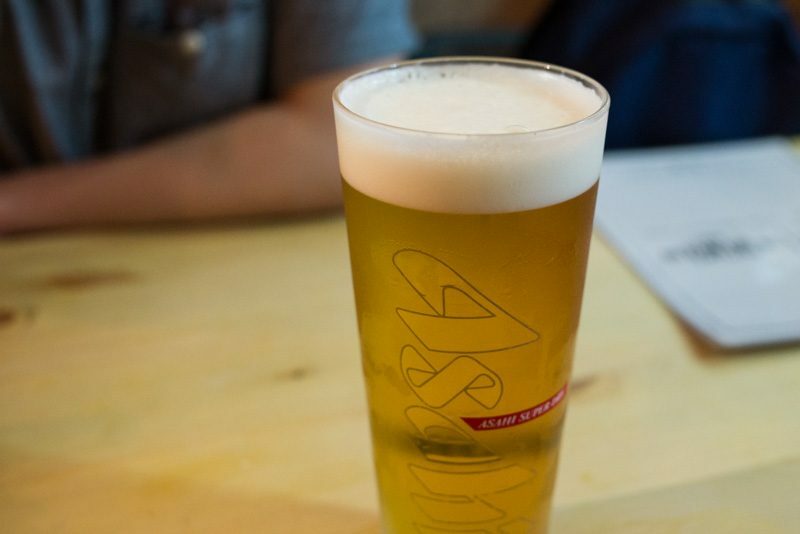 I tried the brand-new Yuzu Lager ($13), which, at the time of writing this article, had only been released a couple of days ago. The team at IZA infuses the yuzu themselves, so I thought it was pretty unique. The drink was smooth and slightly sweet, and I thoroughly enjoyed the subtle yuzu flavour that permeated every sip. 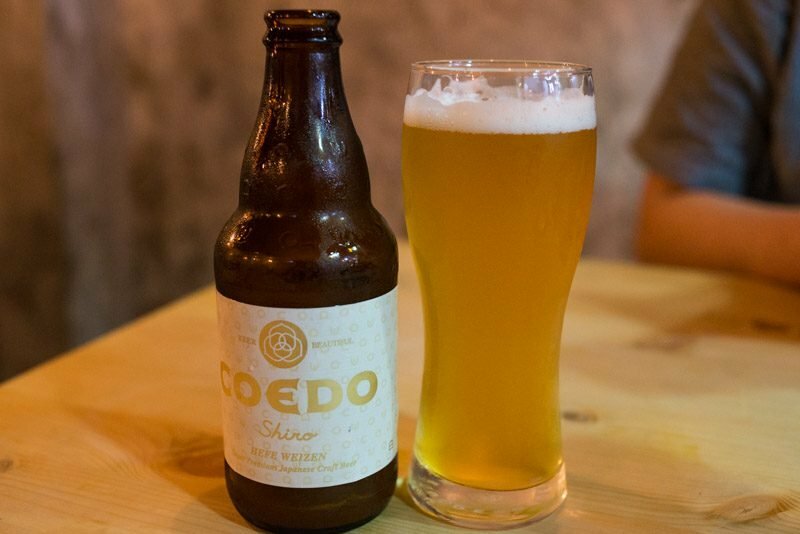 I also tried the Coedo Shiro ($12), a Japanese wheat beer. This also had a subtle fruity sweetness that was rather pleasant. On to the food, the first dish I tried was the Four-Ton Chawanmushi ($4.50). Egg lovers, you’re going to want to know about this. 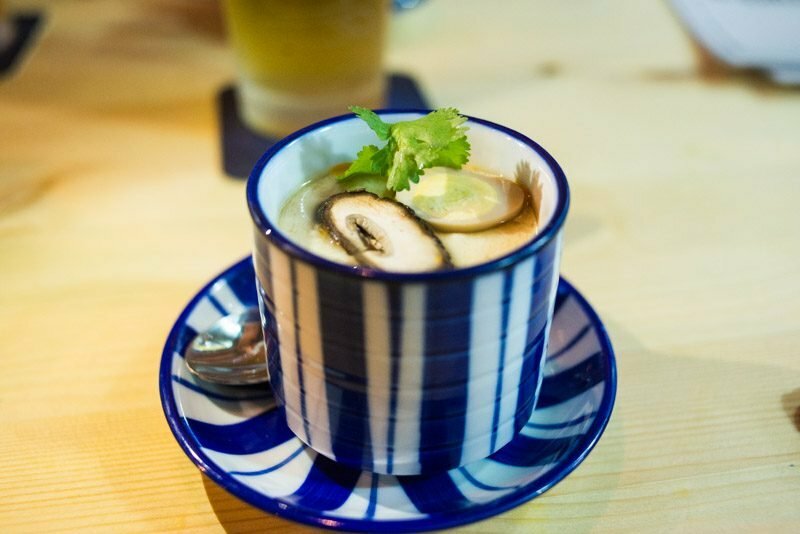 It’s your classic chawanmushi, but with four different types of eggs incorporated into it. There is, of course, the chicken egg which is steamed and forms the bulk of the chawanmushi. 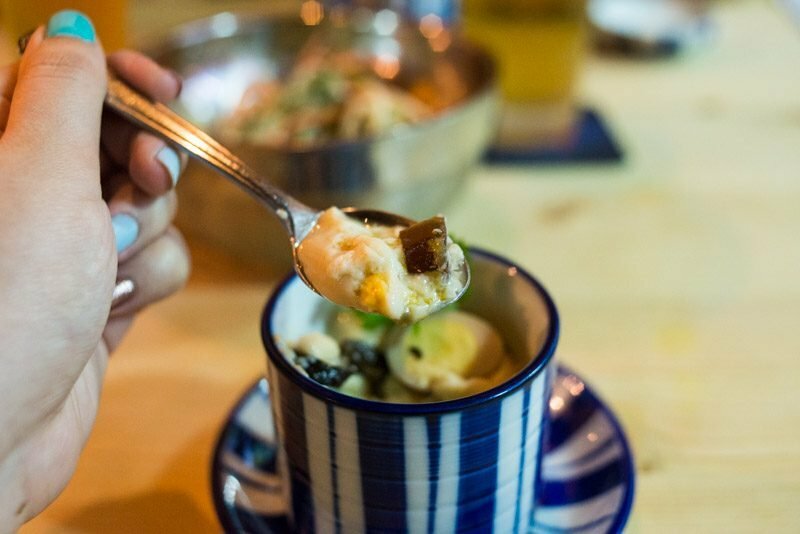 Embedded inside the steamed egg are chunks of century egg and salted egg. And sitting on top is half a hard-boiled quail egg. This chawanmushi was executed almost perfectly. The chicken egg was incredibly smooth, with no flaws. The play of textures, due to the different eggs, was rather interesting and unique. Taste-wise, it was flavourful, albeit a little salty. 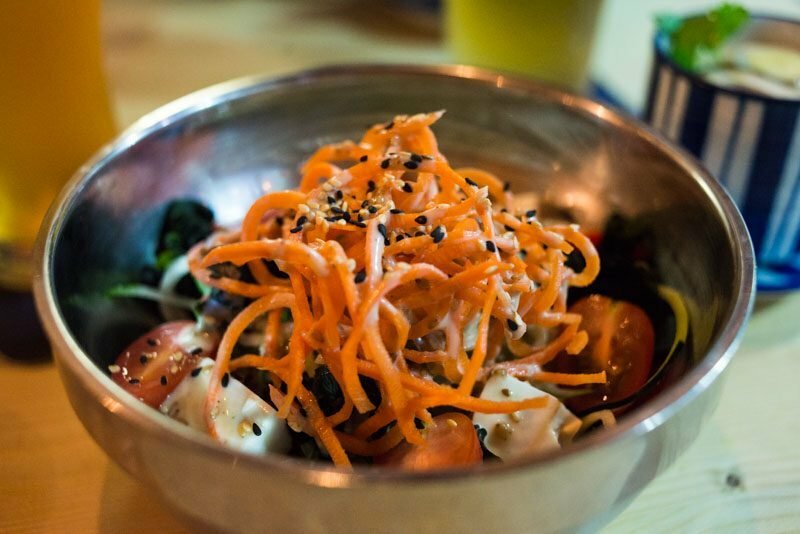 Another light dish to start with would be the TSB Salad ($5.50). It was a mixture of cucumber, zucchini, carrot, seaweed, tofu, and tomato, with a fragrant sesame dressing. I usually avoid sesame dressing, because I think it’s overdone and I get tired of the taste quite quickly. However, IZA’s sesame dressing was sweet and creamy, and very robust in flavour, highlighting the freshness of the vegetables. Ah, we’ve come to one of the things I was looking forward to trying the most: the Otah Tamago ($6.90). 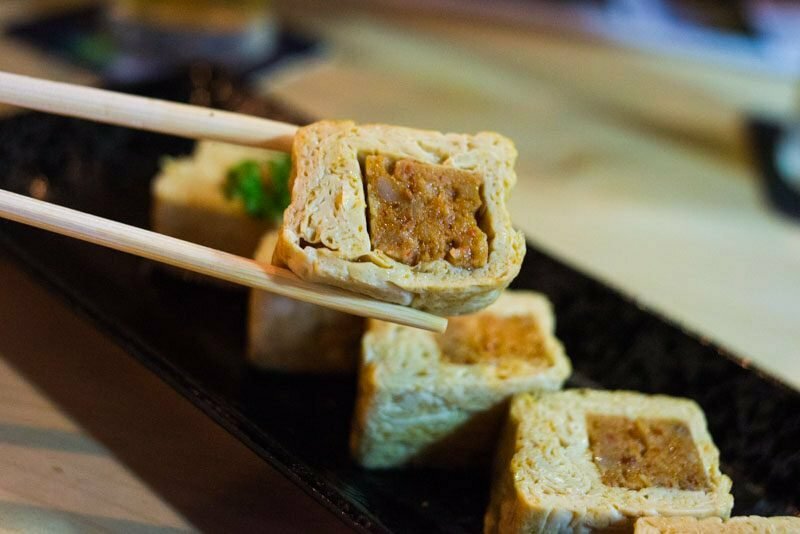 With otah encased in tamago (Japanese omelette), this dish is an attempt to elevate local street food, and a rather successful one too. 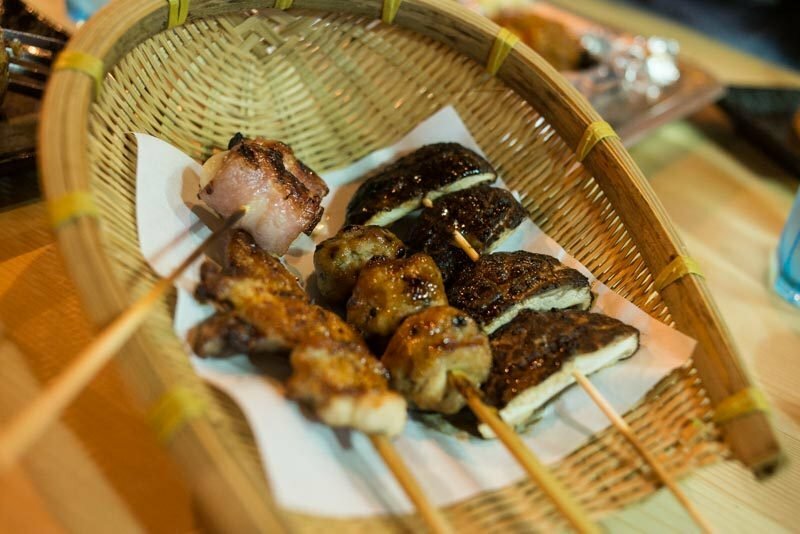 The tamago was sweet and moist, while the otah had a mild kick to it. These flavours complemented each other well, and I appreciated that the otah did not overpower the entire dish. Definitely a must-try here. The next dish I tried could easily be one of the best dishes that IZA serves. This was the Special Yaki Onigiri ($5.90), which is essentially hae bee hiam onigiri. Yet, that still isn’t the most unique thing about this dish. 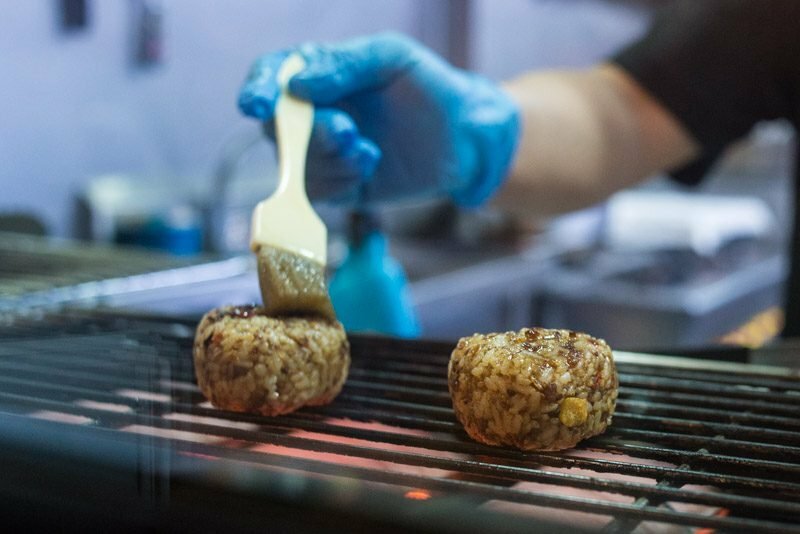 What truly surprised me was that the onigiri, rather than being wrapped with nori (seaweed), is grilled instead to give it a crispy, charred exterior. The spice of the hae bee hiam was in perfect harmony with the smoky flavour of the grilled rice, making the dish truly spectacular. I also opted for a mixture of skewers. My favourite was the Bacon-Wrapped Lychee ($2.80), a combination that I didn’t think would work, but surprisingly did. 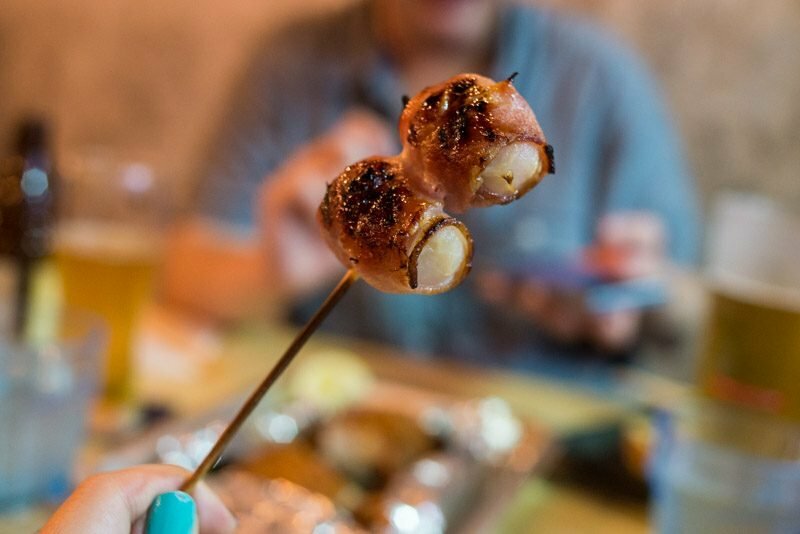 The buttery fragrance of the bacon paired very well with the explosive sweetness of the lychee, making this skewer incredibly addictive. 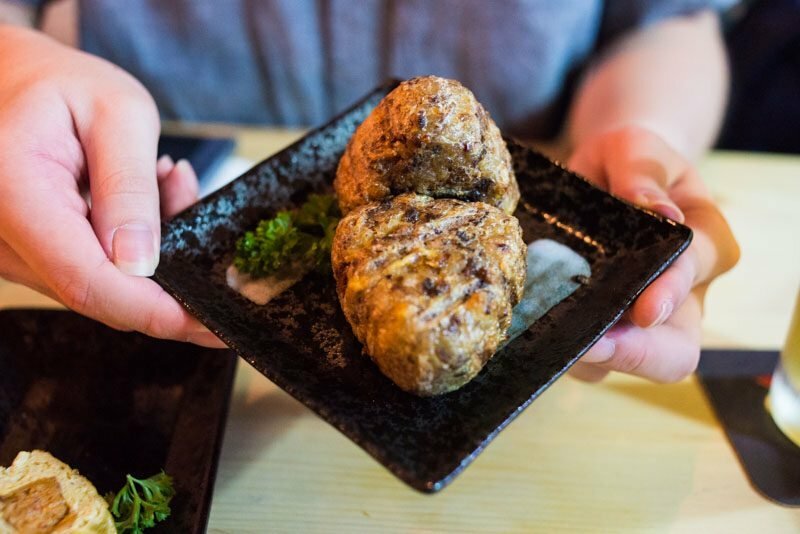 The Chicken & Pork Meatball ($3.50), Chicken Mid-joint ($1.90), and Shiitake Mushroom ($1.90) were all pretty delicious as well. You’d think that with all the good food I’ve just described, IZA couldn’t offer anything better. But no, the Spanish Mackerel With Homemade Chilli ($16), a weekend special, exceeded almost every expectation I had. 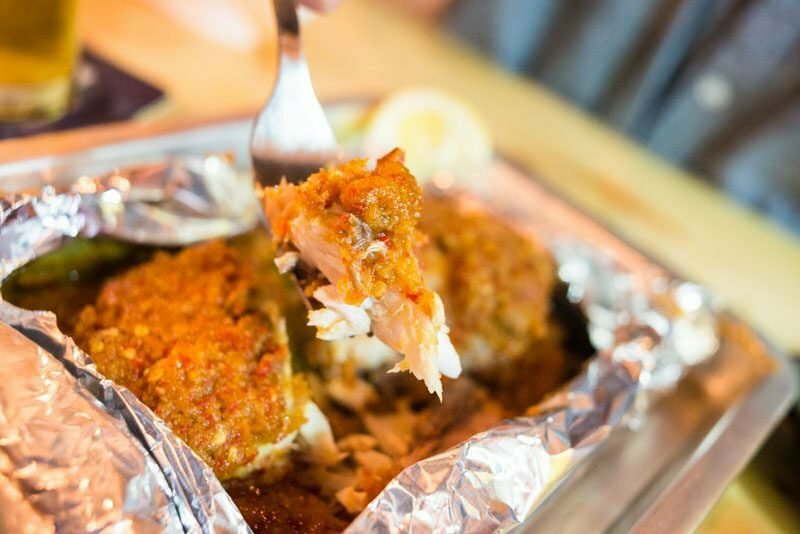 The oven-baked fish was fresh and extremely juicy, much unlike the dry, tough mess you tend to get when fish is baked. The homemade chilli tasted rather similar to sambal, but was far more flavourful and aromatic than your average chilli paste. 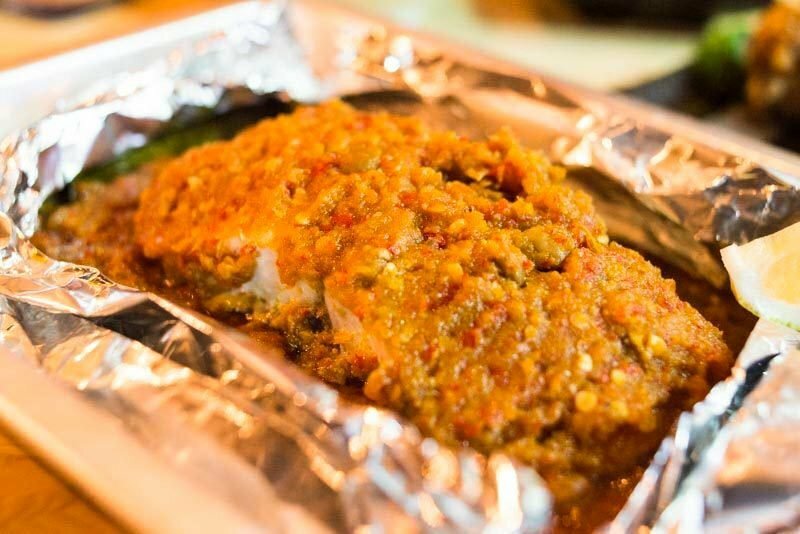 With the chilli flavour infused into the fish, it was truly delicious. The only thing that I thought could be improved was the evenness of the cook on the fish, as some parts were tougher than others. 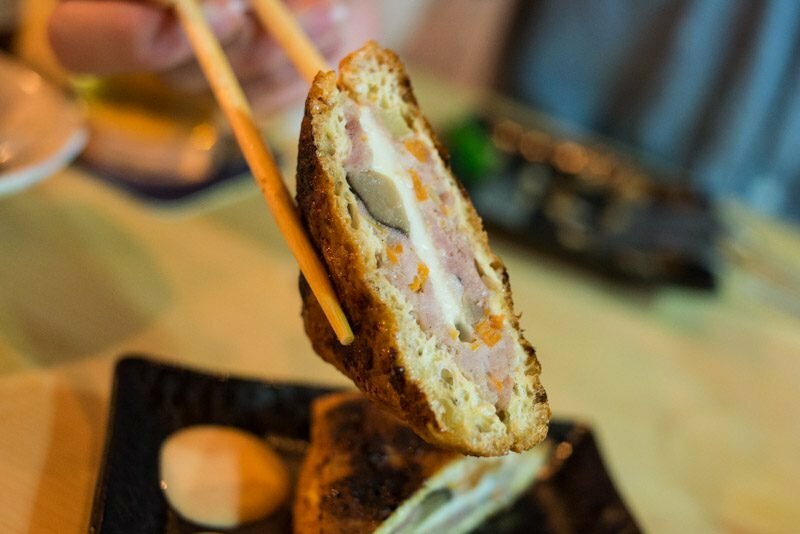 Another interesting fusion dish was the Stuffed Taupok Special ($3). The stuffing includes minced chicken, mozzarella, onions, carrots, and mushrooms. I wasn’t a big fan of this because I felt that the cheese overpowered the entire dish, and I couldn’t really taste anything else. But I guess if you’re a fan of cheese, you would love this. Since I couldn’t get enough of the hae bee hiam onigiri, I had to order the Hae Bee Hiam Spaghetti ($11.90). 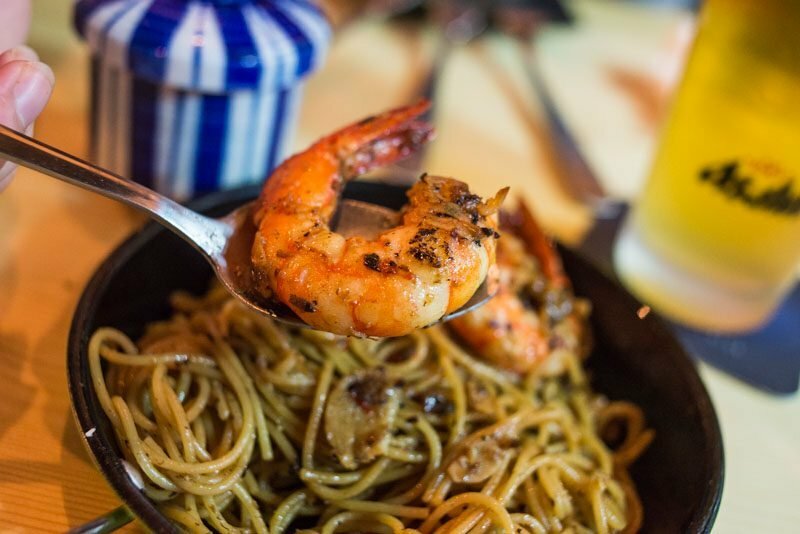 It came with a decent serving of pasta, along with two huge prawns. The pasta, though a little salty, was very robust in flavour. I liked that there wasn’t that sharp and intense hae bee taste that often clashes with other flavours. 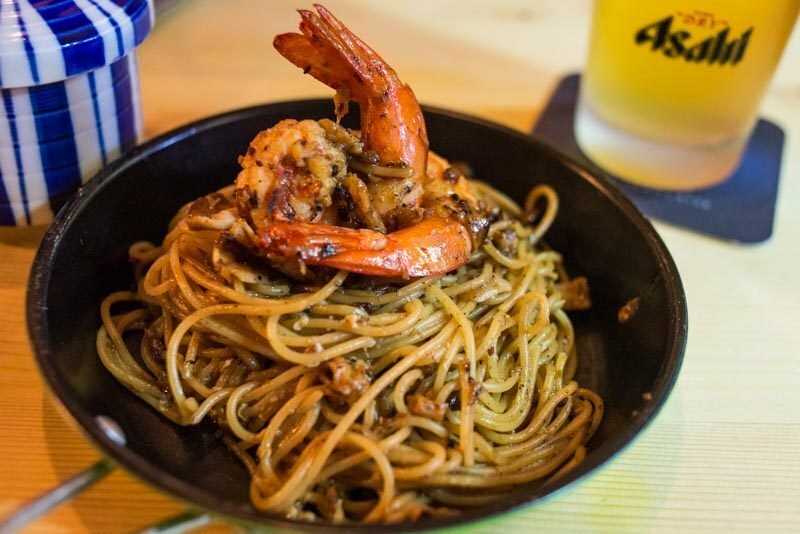 Instead, the hae bee hiam flavour blended seamlessly with the garlic oil, making the pasta irresistibly addictive. The prawns were also cooked perfectly, remaining succulent and juicy. But perhaps three instead of two would make this more worth the price point. 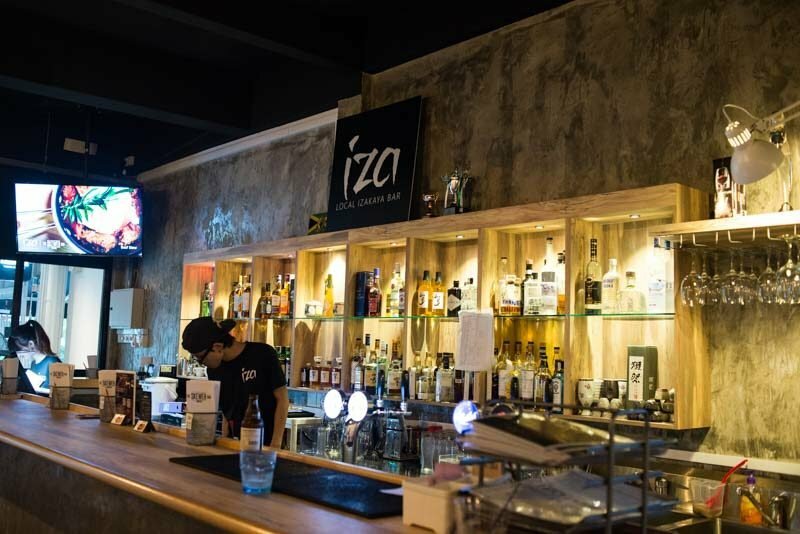 The next time you find yourself in the East, and are looking for somewhere to hang out with your friends, IZA should definitely be on your list. 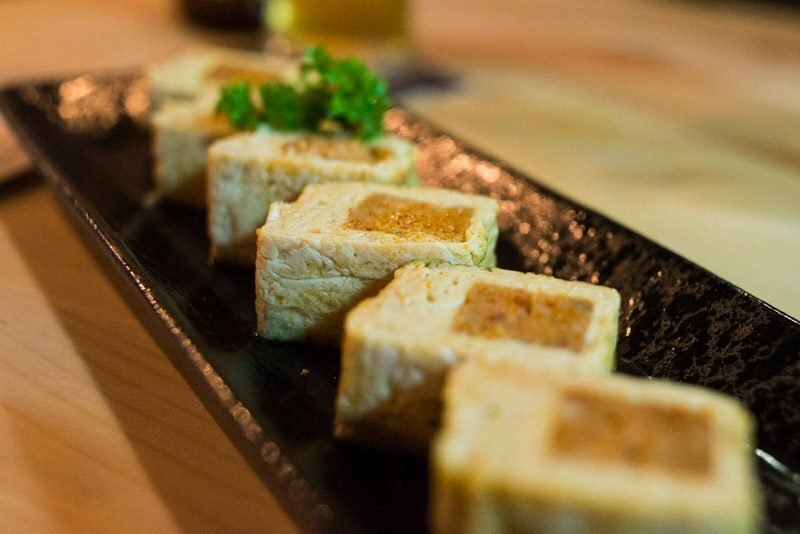 With a wide variety of quality drinks, and many unique fusion food options to choose from, you’ll certainly enjoy this izakaya spot!